GEORGE and MARTHA WASHINGTON entertained a good deal—at the presidential residences in New York and Philadelphia and, of course, at Mount Vernon where they always welcomed a stream of visitors. Although Martha Washington undoubtedly owned several cookbooks only two survive. 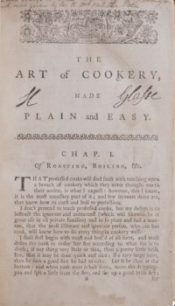 Her copy of The Art of Cookery, Made Plain and Easy by Hannah Glasse, first published in 1747, is at Mount Vernon. The other, a manuscript cookbook called Martha Washington’s Booke of Cookery, a collection of 16th and 17th recipes (known as receipts) which she acquired from the family of her first husband Daniel Parke Custis, is at the Historical Society of Pennsylvania. In 1981 it was published in an edited and annotated version by Karen Hess. 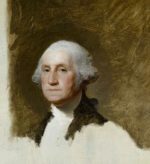 At the cookery section of Mount Vernon’s website you can peruse many recipes for dishes that were served at Washington dinners …. and make them yourself as they have been adapted for modern methods of preparation and cooking. I have chosen two suitable for this week’s holiday: one a dressing to serve with your bird, and another which is great for using those leftovers. Both are featured on the menu at the Mount Vernon restaurant. Mix apples, celery, dates, figs, nutmeats and toasted bread cubes. Moisten with grape juice. Arrange ingredients in a 9×13-inch pyrex dish. Baste with turkey drippings. Bake at 350 degrees for 30 to 45 minutes. Preheat empty cookie sheet in 375 degree oven. Add pie shell to hot cookie sheet and bake for 10 minutes. (This will make it crisp.) Cook celery in butter until tender; stir in turkey and pimento. Beat together eggs, milk, mayonnaise, mustard and salt. Stir in turkey mixture. Pour into pie shell. Sprinkle with cheese and paprika. Bake at 375 degrees for 25 to 35 minutes, until silver knife inserted near center comes out clean. Enjoy Thanksgiving Day with friends and family, and count your blessings. MARTHA WASHINGTON and ELIZABETH WILLING POWEL did not have a great deal in common though they were fast friends and faithful correspondents. One thing that did bind them together was grief. They had both suffered losses: Martha of her first husband and her four children, and Powel of her husband (in September 1793 as a result of the yellow fever epidemic which had devastated Philadelphia) and her only offspring, two infant sons. Elizabeth Willing Powel never remarried, remaining a widow for thirty-six years. The portrait is of her in old age. As she had no direct heirs she formally adopted her nephew, John Powel Hare, the one for whom she had purchased Washington’s six coach horses. Hare changed his name to John Hare Powel. 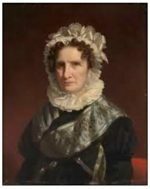 Elizabeth Willing Powel died on January 17, 1830 at the age of 87. She was by all accounts a truly extraordinary woman. Portrait courtesy American Gallery. Mary V. Thompson, In the Hands of a Good Providence: Religion in the Life of George Washington (Charlottesville: University of Virginia, 2008); LETTER from Elizabeth Willing Powel to Martha Washington, Dec. 24, 1799, Mount Vernon Ladies’ Association of the Union. This LINK provides a self-guided very informative tour of the Powel House in Philadelphia. ELIZABETH WILLING POWEL and George Washington exchanged letters in Philadelphia until he left for Mount Vernon in mid December 1798. Washington paid promptly for the articles that Powel had purchased for him. Clearly the two had a high regard for each other, certainly friendship and admiration, if not something more. Receive, I pray you, my best thanks for the Prints you had the goodness to send me; and my acknowledgments of your kind, and obliging offer to chuse some thing handsome, with which to present Miss Custis [Eleanor “Nelly ” Parke Custis]. The difference between thirty & Sixty (or more) dollars, is not so much a matter of consideration, as the appropriate thing. I presume, she is provided with a Muff; of a tippet I am not so certain; but a handsome Muslin, or any thing else, that is not the whim of the day, cannot be amiss. The cost of which, when furnished, you will please to announce to me. Is there any thing—not of much cost—I could carry Mrs Washington as a memento that she has not been forgotten, in this City? . . . .
Elizabeth Willing Powel sent Washington a bill post haste. The amount of the Articles purchased you will find to be Seventy Four dols. & a half. . . .
Pasted onto the manuscript is a notation, in Elizabeth Willing Powel’s hand, indicating that she paid $65 for a “Piece of Muslin,” $2.50 for “A Doll,” and $7 for a “Thread Case.” The doll was for Eliza Law, the child of Elizabeth Parke Custis, Martha’s eldest grandchild, and her husband John Law. The marriage was not a happy one and ended in divorce. The thread-case, it seems, was for Martha. Illustrated is a thread-case that belonged to Thomas Jefferson’s wife Martha. George Washington replied to Powel immediately——sometimes these exchanges seem a lot like email today! The articles you had the goodness to send me this forenoon (when it was not in my power to acknowledge the receipt of them) came very safe, and I pray you again, to accept my thanks for the trouble I have given you in this business. Enclosed are Seventy five dollars, which is the nearest my present means will enable me to approach $74 50/100 the cost of them. . . . The letter in this post is the response of George Washington to the previous one from ELIZABETH WILLING POWEL in which she informs him that she had found a bundle of letters in one of the drawers of his writing desk which she had purchased and was returning it to him with three wax seals to be certain it would not be tampered with. The letters turned out to have been from Martha Washington to George. He makes light of the incident although he is pleased that Powel had found the letters not someone more “inquisitive,” although the reader would have been disappointed because they contained more evidence of friendship than amorous love. Hmmm. Perhaps. But we cannot confirm this as the letters were destroyed either by Washington himself or by Martha after his death. A Mail of last week brought me the honor of your favor, begun the 11th, and ended the 13th of this instant. Had it not been for one circumstance, which by the bye is a pretty material one—viz.—that I had no love letters to lose—the introductory without the explanatory part of your letter, would have caused a serious alarm; and might have tried how far my nerves were able to sustain the shock of having betrayed the confidence of a lady. But although I had nothing to apprehend on that score, I am not less surprized at my having left those of Mrs Washington in my writing desk; when as I supposed I had emptied all the drawers; mistaken in this however, I have to thank you for the delicacy with which they have been treated. But admitting that they had fallen into more inquisitive hands, the corrispondence would, I am persuaded, have been found to be more fraught with expressions of friendship, than of enamoured love, and, consequently, if the ideas of the possessor of them, with respect to the latter passion, should have been of the Romantic order to have given them the warmth, which was not inherent, they might have been committed to the flames. As we shall not relinquish the hope of seeing you in Virginia whenever it may suit your inclination & convenience, I am about to fulfil the promise I made, of giving you an Account of the Stages on the Road. . . .
Washington concluded by giving Powel the promised detailed account of his trip through the south as president of the United States.